Dixon first played Sub Club back in September 2005, the same year he launched his label Innervisions, alongside Âme. (pronounced “am”. All the time people pronounce it “ami” or “Amy”, but its “am” – the French word for Soul). A true master of his craft, Dixon’s appeal for me is two-fold. It’s the fact he can get away with throwing curveball after curveball into what you think would be a typical ‘Dixon-esque’ set, but NO, he’s gonna drop ‘Frank Ocean – Lost‘ (pardon the hilarious unofficial video, finding a stream of this was tough) before a pillow fight ensues. To quote Gene Wilder, “Little surprises around every corner but nothing dangerous”. He’s also one of the hardest working DJ’s on the circuit squeezing in as many gigs as he can whilst still making edits/remix’s and mixing CD’s. Back in 2005, Dixon mixed a yoga-themed CD (we all love yoga music, don’t lie) for Man Recordings, which featured a phenomenal track by Larry Heard entitled ‘Faint Object Detection’ from his 1996 ‘Alien‘ LP. Larry Heard aka Mr Fingers cemented himself in the Chicago house scene in the 1980 with tracks such as ‘Can you feel it?‘ and ‘The sun can’t compare‘ but also wrote and co-produced tracks such as ‘Touch Me‘ for Lil’ Louis. Lil’ Louis, who just last month held a listening party for his 3rd album in Sub Club, rose to fame with his track ‘French Kiss‘, which defined an era really. It has been out 27 years and is still as current today as it was back in 1989. It did run into some backlash though when MP Jack Straw criticised it because “his son couldn’t understand why so many people should buy a record of a woman panting, then groaning, interspersed with the occasional mumbled phrase”. Regardless, it’s stood the test of time and there’s multiple versions, my personal favourite being this vocal mix. Lil’ Louis first played Harri & Dom’s Subculture back in 1997, the same year Basement Jaxx had their first ‘out of London‘ gig, also at Sub Club. Fast forward 10 years and the 2 have worked together on the 1999 record ‘Yo Yo‘ and the 2009 track ‘One more chance‘. Basement Jaxx have had multiple releases on XL recordings including ‘Where’s your head at?‘ and ‘Oh my gosh‘. Also on XL and doing the rounds at festivals all over this year was DJ Koze’s remix of ‘Lapsley – Operator‘. Famed for his remixes (credited with 186 on Discogs), DJ Koze made his presence felt on Mount Kimbie’s track ‘Made to stray‘ back in 2013. 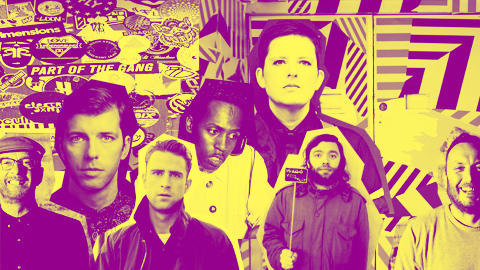 Also getting in on the remix action for Mount Kimbie was Prosumer and Tama Sumo on ‘William‘. Kerstin Egert (aka Tama Sumo) is a Berlin based DJ and resident at the world famous Berghain’s Panorama Bar. She’s been DJing since 1994, and oddly enough didn’t even know about her first DJ booking until she saw her name on the printed posters. Her sets rely heavily on improvisation and minimal uses of effects, letting the music speak for itself – which in the Subbie, is all you can really ask for. Kerstin is also in a civil partnership with Lerato Khathi (aka Lakuti), who runs the labels Süd Electronic alongside Alan Abrahams (aka Portable) which has had releases by Move D and Stump Valley. Lakuti also founded the Uzuri Label, which through their booking agency represents artists such as Levon Vincent, Joey Anderson and Portable. Portable’s track ‘Nano Flower‘ was featured on ‘The Lifesaver Compilation‘ released by Live at Robert Johnson, a label run by the eponymous Frankfurt club. Also featured on the compilation is a track entitled ‘People Is A Crackhead‘ by Tuff City Kids, aka Philip Lauer and Gerd Janson (who is also resident DJ at Robert Johnson in Frankfurt I may add, the links just keep on coming). Gerd Janson has a plethora of remixes and edits under his belt, a firm favourite of mine being his edit of Arman Van Helden’s take on Tonja Dantzler’s ‘In and out of my life’. I remember Sonny Fodera playing this at a Defected night in Ibiza a few years back. Signed to Defected Records, Sonny Fodera worked with Cajmere on ‘You’re the one‘ back in 2013. Most recognisable for his tracks ‘Percolator‘ and ‘Flash‘ which he worked on with Green Velvet, Cajmere is a nothing short of a legend. Along the years, Cajmere has worked extensively with Gene Farris including this edit of the Fatback Band’s “Do the bus stop” called ‘Mars Bar‘. Local wonder boy, Denis Sulta, also dropped an edit of ‘Do the bus stop’ entitled ‘Gum‘ on his Zopiclone EP which was released by Mister Saturday Night under his alias Atlus. After much anticipation, one of his most popular tunes ‘It’s Only Real‘ finally got a releases on Numbers, the record label owned by other Glasgow wonder boy, Jackmaster. Jack recently threw a Numbers Mastermix party for WHP which included Denis Sulta and Gerd Janson amongst other big guns such as Marcel Dettmann, Bicep & Ricardo Villalobos. What better way to bring in 2017 than catching the blossoming partnership of Jackmaster and Gerd Janson down at Sub Club.